Trees can provide a number of different services that depend on their size, species, and location. Their leaves can trap air pollutants either through taking them up or through deposition, thus removing them from the surrounding air. They also intercept rainfall and so slow the rate with which water reaches the ground, increasing infiltration where permeable surfaces are available and additionally reducing runoff through evaporation and root uptake. Through their wide variation in shape, size and demands they are very versatile and can be used in multiple settings. Trees are generally perceived as aesthetically pleasing additions to the landscape and thus provide many less tangible benefits that increase quality of life considerably – see further below for details on the main benefits and also the additional benefits provided. While trees are not themselves ‘accessible’, they make areas more attractive. Streets with trees have 20% higher bicycle traffic than those without. Parks with a number of trees are used more than those without, however dense tree stands can increase fear of crime. A single tree can reduce PM concentration by 15-20%. Street trees reduce prevalence of asthma in children and death rates from respiratory diseases. 10-15% of rainfall are intercepted by canopies (2,000-3,000 litres per year, according to studies in the US). Keeping tree pits open increases infiltration into the ground, with leaf litter acting like a sponge, and so reduces runoff even further (up to 62% reduction of total rainfall volume on area, compared to 10-20% for asphalt). In severely compacted soils, tree roots can improve infiltration by 153%. Trees planted densely along river banks (i.e. in the riparian zone) can act to slow water flow and influence fluvial flooding downstream. Reduce air temperature/UHI (increasing green cover by 10% reduces temperatures by 3 degrees, areas under canopies can be 1-10 degrees cooler than open areas). iTree studies in the UK have estimated annual C sequestration to be 3.65 – 7.4kg/tree. Additionally, by reducing energy use (e.g. from cooling a building) they indirectly reduce GHG emissions (see additional benefits). Depends on location, size and species of tree, but can provide important corridors. Especially large trees are of high importance for biodiversity. Preservation of trees in developments and preservation of especially larger areas of existing woodland can have a high impact on urban biodiversity. By allowing increased infiltration, trees improve water quality. Leaf litter on the ground reduces soil erosion, trees intercept pollutants and infiltrate them. Not much specific literature available. Aesthetic benefits have been proven multiple times, impact on mental health (people feel more relaxed in areas with trees), place shaping. Trees can be important cultural assets and facilitate some cultural activities. This is dependent on their context – for example, old trees that are part of village greens may have different cultural meanings than newly planted street trees. Trees in the surrounding environment can lead to a 5-10% increase in property value, and increase spending in business areas which can also mean that businesses are more likely to settle down in these attractive areas. Due to their impact on surface water flooding, trees can influence the extent of a flood – however, singular trees are unable to make a big impact and can only contribute little to fluvial flooding. While a single tree may not have an immediately perceptible impact, at least not on a bigger scale, the cumulative effect of trees should be considered with regards to surface water management. Studies have shown that trees over asphalt – even young trees – can reduce runoff by 62% compared to the same area of naked asphalt, and a 5% increase in tree cover in an area can reduce total runoff by 2%. Trees act as interception and source control, reducing the amount of runoff that is generated. Water that is not intercepted by the canopy can infiltrate into the tree pit and be led further – if necessary – into storage structures or further treatment. Similar functions are provided by amenity areas, green roofs or permeable surfaces. 15-400 per tree – low to medium. Factors: depends on species and age of tree as well as planting site. Increased number of tree planted reduces relative cost per tree. Context: Residential and Industrial. Retrofit is possible. Trees need enough space for root growth and development, and a ready supply of water and oxygen. Leaving the tree pit open facilitates this and can in turn prevent the upwards growth of roots. If trees are planted next to pavements, supporting these with pillars or similar structures prevents soil compaction and aids growth of the tree and water infiltration. Refer to planning guidance to understand how trees are best used to maximise benefits (the Woodland Trust provides a quick guidance overview). Costs: medium, but can be high if maintenance activities are not planned properly and trees are not selected adequately to environment. Typical maintenance activities: main costs arise from pruning. If design fails to take account of the need of the trees, it is likely that the tree will need to be replaced sooner than necessary, leading to an increase in cost and loss of functionality. Urban parks with trees reduce stress levels more than those without. Trees have positive impacts on exercise regularity. They have also been connected to positive impacts on health of newborns/maternal health. Allergy attacks due to pollen are possible, additionally some trees can produce VOCs and increase ozone generation. Selection of species is important as well as their placing in the urban ladscape to avoid trapping of pollutants. Trees can act as buffers against noise and placed strategically minimise the impact of highly used roads. Release of VOC can have negative impacts on GHG emissions, as can fuel-intense maintenance. It is therefore important to select the right species and keep maintenance as low carbon as possible (coordinating maintenance activities, minimising them (e.g. by selecting suitable species for certain areas and so minimising their potential need for maintenance or replacement) and resorting to manual labour where possible). Nordh, H., Hartig, T., Hagerhall, C. M. and Fry, G. (2009) ‘Components of small urban parks that predict the possibility for restoration’, Urban Forestry & Urban Greening, 8(4), pp. 225–235. In densifying cities, small green spaces such as pocket parks are likely to become more important as settings for restoration. The variables most predictive of the likelihood of restoration were the percentage of ground surface covered by grass, the amount of trees and bushes visible from the given viewing point, and apparent park size. Commission for Architecture and the Built Environment (2005) ‘Decent parks? Decent behaviour? : The link between the quality of parks and user behaviour Contents Foreword’, pp. 1–17.This publication provides practical suggestions for improving public spaces in ways that can help reduce vandalism and other anti-social behaviour. It is informed by research commissioned by CABE Space in 2004. 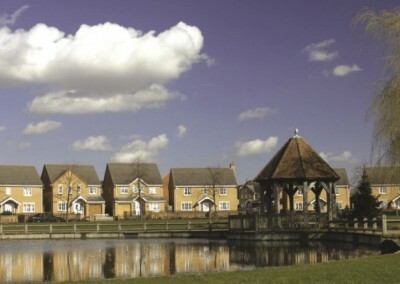 The research, carried out by GreenSpace, involved over twenty local authorities and seventy-five community representatives concerned with green spaces. Alcock, I., White, M. P., Wheeler, B. W., Fleming, L. E. and Depledge, M. H. (2014) ‘Longitudinal effects on mental health of moving to greener and less green urban areas.’, Environmental science & technology. American Chemical Society, 48(2), pp. 1247–55. This study used panel data to explore three different hypotheses about how moving to greener or less green areas may affect mental health over time. Moving to greener urban areas was associated with sustained mental health improvements, suggesting that environmental policies to increase urban green space may have sustainable public health benefits. Donovan, G. H., Butry, D. T., Michael, Y. L., Prestemon, J. P., Liebhold, A. M., Gatziolis, D. and Mao, M. Y. (2013) ‘The relationship between trees and human health: evidence from the spread of the emerald ash borer.’, American journal of preventive medicine, 44(2), pp. 139–45 Results suggest that loss of trees to the emerald ash borer increased mortality related to cardiovascular and lower-respiratory-tract illness. This finding adds to the growing evidence that the natural environment provides major public health benefits. Donovan, G. H., Michael, Y. L., Butry, D. T., Sullivan, A. D. and Chase, J. M. (2011) ‘Urban trees and the risk of poor birth outcomes’, Health and Place, 17(1), pp. 390–393.This paper investigated whether greater tree-canopy cover is associated with reduced risk of poor birth outcomes in Portland, Oregon. We found that a 10% increase in tree-canopy cover within 50. m of a house reduced the number of small for gestational age births by 1.42 per 1000 births (95% CI-0.11-2.72). Results suggest that the natural environment may affect pregnancy outcomes and should be evaluated in future research. Lovasi, G. S., Quinn, J. W., Neckerman, K. M., Perzanowski, M. S. and Rundle, A. (2008) ‘Children living in areas with more street trees have lower prevalence of asthma.’, Journal of epidemiology and community health, 62(7), pp. 647–9. Street trees were associated with a lower prevalence of early childhood asthma. This study does not permit inference that trees are causally related to asthma at the individual level. Milligan, C. and Bingley, A. (2007) ‘Restorative places or scary spaces? The impact of woodland on the mental well-being of young adults.’, Health & place, 13(4), pp. 799–811. Engaging with notions of restoration and therapeutic landscapes literatures, the paper maintains that we cannot accept uncritically the notion that the natural environment is therapeutic. Indeed, from this paper it is clear that a range of influences acts to shape young people’s relationship with woodland environments, but not all of these influences do so in positive ways. University of Washington (2012) ‘Crime and Public Safety. How Trees and Vegetation Relate to Aggression and Violence.’ 1 of 13. 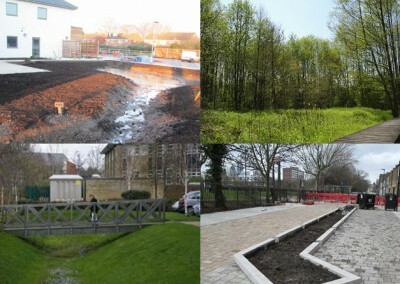 Faculty of Public Health (2010) ‘Great Outdoors : How Our Natural Health Service Uses Green Space To Improve Wellbeing’, pp. 1–8. Luttik, J. (2000) ‘The value of trees, water and open space as reflected by house prices in the Netherlands’, Landscape and Urban Planning, 48(3-4), pp. 161–167. 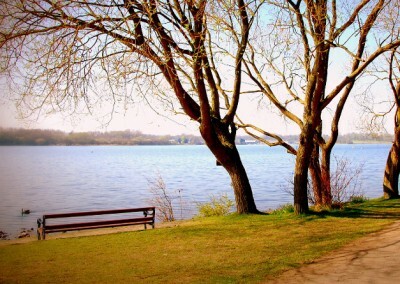 This study found the largest increases in house prices due to environmental factors (up to 28%) for houses with a garden facing water, which is connected to a sizeable lake. We were also able to demonstrate that a pleasant view can lead to a considerable increase in house price, particularly if the house overlooks water (8–10%) or open space (6–12%). In addition, the analysis revealed that house price varies by landscape type. Attractive landscape types were shown to attract a premium of 5–12% over less attractive environmental settings. Saphores, J.-D. and Li, W. (2012) ‘Estimating the value of urban green areas: A hedonic pricing analysis of the single family housing market in Los Angeles, CA’, Landscape and Urban Planning, 104(3-4), pp. 373–387.This study analyses 20,660 transactions of single family detached houses sold in 2003 and 2004 in the city of Los Angeles, CA, to estimate the value of urban trees, irrigated grass, and non-irrigated grass areas. Tabbush, P (2010) ‘Cultural Values of Trees, Woods and Forests’ Forest Research.This report presents the results of a literature review and primary research into the importance of the cultural values of trees, woods and forests for sustainable forest management (SFM). The concept of ‘cultural capital’ emerged as helpful in distinguishing between the values and norms that stakeholders (including visitors and local communities) bring to woodlands (‘embodied cultural capital’), and physical attributes of the woodlands that are of cultural value (‘objectified cultural capital’, or ‘assets’). Armson, D., Stringer, P. and Ennos, A. R. (2013) ‘The effect of street trees and amenity grass on urban surface water runoff in Manchester, UK’, Urban Forestry & Urban Greening, 12(3), pp. 282–286. This study assessed the impact of trees upon urban surface water runoff by measuring the runoff from 9 m2 plots covered by grass, asphalt, and asphalt with a tree planted in the centre. It was found that, while grass almost totally eliminated surface runoff, trees and their associated tree pits, reduced runoff from asphalt by as much as 62%. The reduction was more than interception alone could have produced, and relative to the canopy area was much more than estimated by many previous studies. Davies, H. and Doick, K. (2015) ‘Valuing the carbon sequestration and rainwater interception ecosystem services provided by Britain’s urban trees.’ Bonn. Seitz, J. and Escobedo, F. (2014) ‘Urban Forests inFlorida : Trees Control Stormwater Runoff and Improve Water Quality’. University of Florida. 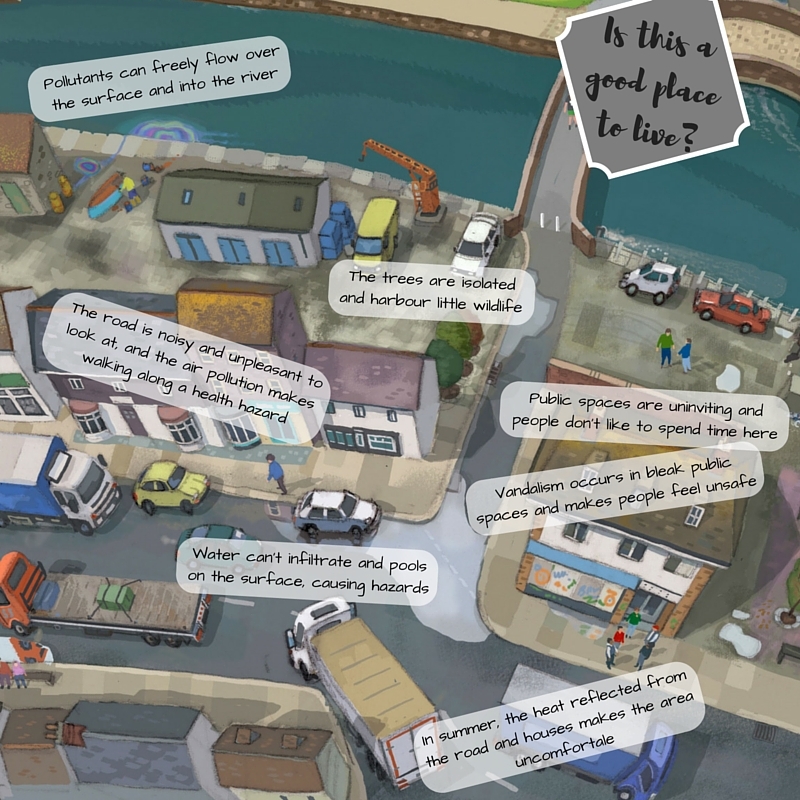 Neighbourhoods with fewer trees have the potential for increased stormwater, pollutants, and chemicals flowing into their water supply and systems, resulting in health risks, flood damage, and increased taxpayers’ dollars to treat the water. In Santa Monica, CA, rainfall interception was measured for 29,229 street and park trees. Researchers found that the trees intercepted 1.6% of total precipitation over a year, providing an estimated value of $110,890 ($3.80 per tree) saved on avoided stormwater costs. Armson, D., Stringer, P. and Ennos, A. R. (2012) ‘The effect of tree shade and grass on surface and globe temperatures in an urban area’, Urban Forestry & Urban Greening, 11(3), pp. 245–255. The results from this study show that both grass and trees can effectively cool surfaces and so can provide regional cooling, helping reduce the urban heat island in hot weather. In contrast grass has little effect upon local air or globe temperatures, so should have little effect on human comfort, whereas tree shade can provide effective local cooling. Forestry Commission (2013) Air temperature regulation by urban trees and green infrastructure. Farnham.Vegetation has a key role to play in contributing to the overall temperature regulation of cities. Informed selection and strategic placement of trees and green infrastructure can reduce the UHI and cool the air by between 2ºC and 8ºC, reducing heat-related stress and premature human deaths during high-temperature events. Nowak, D. J., Greenfield, E. J., Hoehn, R. E. and Lapoint, E. (2013) ‘Carbon storage and sequestration by trees in urban and community areas of the United States’, Environmental Pollution, (178), pp. 229–236. Urban whole tree carbon storage densities average 7.69 kg C m2 of tree cover and sequestration densities average 0.28 kg C m2 of tree cover per year. Total tree carbon storage in U.S. urban areas (c. 2005) is estimated at 643 million tonnes ($50.5 billion value; 95% CI ¼ 597 million and 690 million tonnes) and annual sequestration is estimated at 25.6 million tonnes ($2.0 billion value; 95% CI ¼ 23.7 million to 27.4 million tonnes). Lehmann, S. (2014) ‘Low carbon districts: Mitigating the urban heat island with green roof infrastructure’, City, Culture and Society, 5(1), pp. 1–8. doi: 10.1016/j.ccs.2014.02.002.The integration of trees, shrubs and flora into green spaces and gardens in the city is particularly important in helping to keep the urban built environment cool, because buildings and pavements increase heat absorption and reflection (what is called the urban heat island effect). Integrated urban development with a focus on energy, water, greenery and the urban microclimate will have to assume a lead role and urban designers will engage with policy makers in order to drastically reduce our cities’ consumption of energy and resources. This paper introduces the holistic concept of green urbanism as a framework for environmentally conscious urban development. Alvey, A. A. (2006) ‘Promoting and preserving biodiversity in the urban forest’, Urban Forestry & Urban Greening, 5(4), pp. 195–201. The potential for urban areas to harbor considerable amounts of biodiversity needs to be recognized by city planners and urban foresters so that management practices that preserve and promote that diversity can be pursued. Management options should focus on increasing biodiversity in all aspects of the urban forest, from street trees to urban parks and woodlots. Mörtberg, U. and Wallentinus, H.-G. (2000) ‘Red-listed forest bird species in an urban environment — assessment of green space corridors’, Landscape and Urban Planning, 50(4), pp. 215–226.The logistic regression models showed that important properties of remnants of natural vegetation were large areas of forest on rich soils, together with connectivity in the form of amounts of this habitat in the landscape. These properties were associated with the green space corridors. Implications for the design of urban green space corridors would be to treat mature and decaying trees and patches of moist deciduous forest as a resource for vulnerable species, and to conserve large areas of natural vegetation together with a network of important habitats in the whole landscape, in this case forest on rich soils, also in built-up areas. Stagoll, K., Lindenmayer, D. B., Knight, E., Fischer, J. and Manning, A. D. (2012) ‘Large trees are keystone structures in urban parks’, Conservation Letters, 5(2), pp. 115–122.This study found that (1) large trees had a consistent, strong, and positive relationship with five measures of bird diversity, and (2) as trees became larger in size, their positive effect on bird diversity increased. Large urban trees are therefore keystone structures that provide crucial habitat resources for wildlife. Hence, it is vital that they are managed appropriately. With evidence-based tree preservation policies that recognize biodiversity values, and proactive planning for future large trees, the protection and perpetuation of these important keystone structures can be achieved. Bird, W. (2007) ‘Natural Thinking’, Royal Society for the Protection of Birds, pp. 1–116. McPherson, E. G., Simpson, J. R., Peper, P. J., Gardner, S. L., Vargas, K. E. and Xiao, Q. (2007) Northeast Community Tree Guide. Presents benefits and costs for representative small, medium, and large deciduous trees and coniferous trees in the Northeast region derived from models based on indepth research carried out in the borough of Queens, New York City. Average annual net benefits (benefits minus costs) increase with mature tree size and differ based on location: $5 (yard) to $9 (public) for a small tree, $36 (yard) to $52 (public) for a medium tree, $85 (yard) to $113 (public) for a large tree, $21 (yard) to $33 (public) for a conifer. Roy, S., Byrne, J. and Pickering, C. (2012) ‘A systematic quantitative review of urban tree benefits, costs, and assessment methods across cities in different climatic zones’, Urban Forestry & Urban Greening, 11(4), pp. 351–363. Urban trees can potentially mitigate environmental degradation accompanying rapid urbanisation via a range of tree benefits and services. But uncertainty exists about the extent of tree benefits and services because urban trees also impose costs (e.g. asthma) and may create hazards (e.g. windthrow). Few researchers have systematically assessed how urban tree benefits and costs vary across different cities, geographic scales and climates. This paper provides a quantitative review of 115 original urban tree studies, examining: (i) research locations, (ii) research methods, and (iii) assessment techniques for tree services and disservices. The Mersey Forest (2014) Urban Catchment Forestry: The strategic use of urban trees and woodlands to reduce flooding, improve water quality, and bring wider benefits. S. Environmental Protection Agency (2013) Stormwaterto Street Trees. Washington, DC. Wang, Y., Bakker, F., de Groot, R. and Wörtche, H. (2014) ‘Effect of ecosystem services provided by urban green infrastructure on indoor environment: A literature review’, Building and Environment, 77, pp. 88–100.The economic effects of adjoining vegetation and green roofs on climate regulation provided energy savings of up to almost $250/tree/year, while the air quality regulation was valued between $0.12 and $0.6/m2 tree cover/year. Maximum monetary values attributed to noise regulation and aesthetic appreciation of urban green were $20 – $25/person/year, respectively. Of course these values are extremely time- and context-dependent but do give an indication of the potential economic effects of investing in urban green infrastructure. The Woodland Trust (2011) Trees orTurf ? The costs of woodland in managed green space are £1,500/ha/a for the first 4 years after establishment, after which they become a cheaper alternative to amenity grassland, reducing annual maintenance costs per hectare to £630. 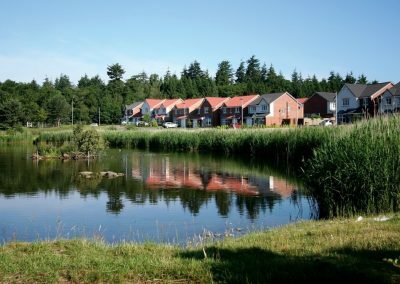 The Woodland Trust (2015) ‘Practical Guidance: Residential Developments and Trees’.Planting trees can slow the flow of water and reduce surface water runoff by up to 62 per cent compared to asphalt. A single young tree planted in a small pit over an impermeable asphalt surface can reduce runoff by around 60 per cent, even during the winter when it is not in leaf. Tree roots can increase infiltration rates in compacted soils by 63 per cent, and in severely compacted soils by 153 per cent. A single tree has been estimated to reduce PM concentration by 15-20 per cent. Natural England has estimated that access to quality green space could save around £2.1 billion in health care costs. The presence of trees is perceived as indicating a more cared for neighbourhood and the presence of street trees was associated with a decreased incidence of crime. 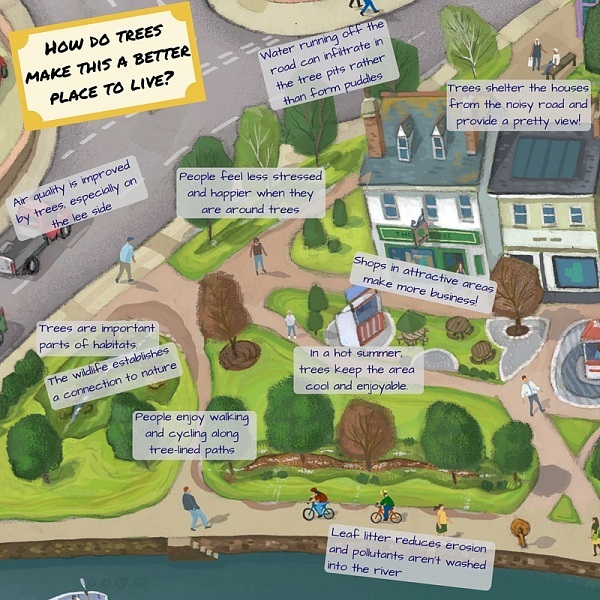 Sustrans (no date): Introducing plants and trees into your street.